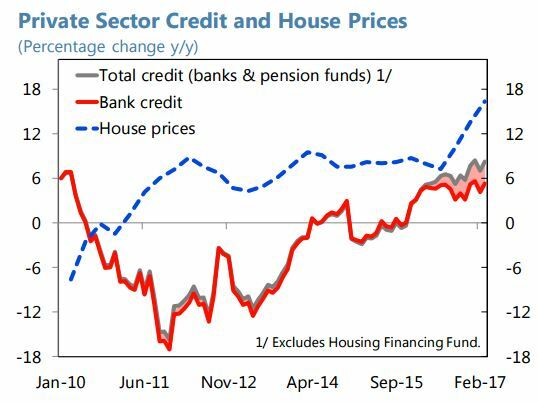 “Housing prices have surged despite still moderate credit growth. Total credit to the private sector, including loans from pension funds which now account for about half of new mortgages, has been growing at close to 8 percent y/y. Despite the recent pick up in (mostly inflation indexed) mortgage lending, the ratio of household debt to GDP has fallen from a peak of some 120 percent in 2010 to below 80 percent in 2016. Housing prices climbed almost 10 percent in 2016, centered on Reykjavík where the crowding out of homebuilding by hotel construction, and of rentals to residents by rentals to tourists, is most acute. A supply response appears to be kicking in, however, with residential investment expanding by 34 percent in 2016. For now, investment financing has a large element of retained earnings”, according to the new IMF report on Iceland.